Have you ever fancied walking on water? Well, now you can. Kind of. 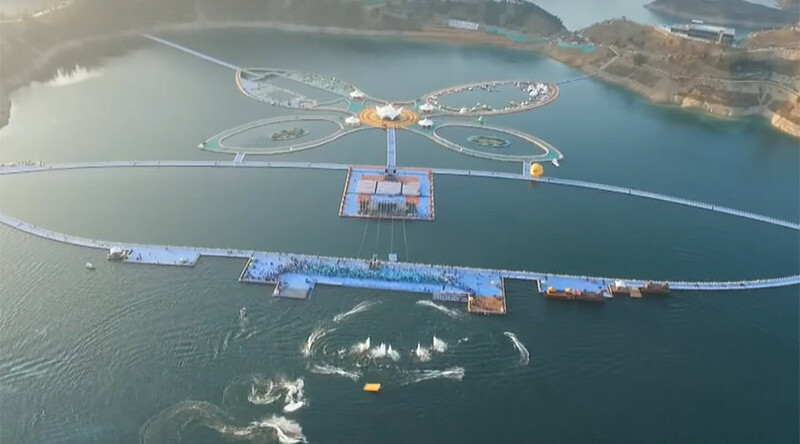 Chinese tourism officials have just opened a record breaking 50 square kilometer floating walkway on the Hongshui River. The walkway, located in Luodian County in Guizhou province, is a staggering 5.13 km (3.19 miles) long and covers an area of over 54,000 square meters and would take the average person 10 hours to traverse. The attraction is composed of more than 200,000 floating objects, which are anchored to the river bed, and has so far seen over 60,000 tourists flock to the area since opening on New Year’s Day, according to Xinhua News. Dotted along the stretch are numerous activity centers where visitors can enjoy various entertaining displays and take part in water sports, including the use of jetpacks powered by the river which shoot tourists into the air. At night, the entire spectacle lights up, and tourists are treated to a dazzling display, including an impressive firework show. This is the latest in a chain of massive Chinese tourism infrastructure projects, which includes the glass mountain walkway in Tianmen, which was opened to the public last August.